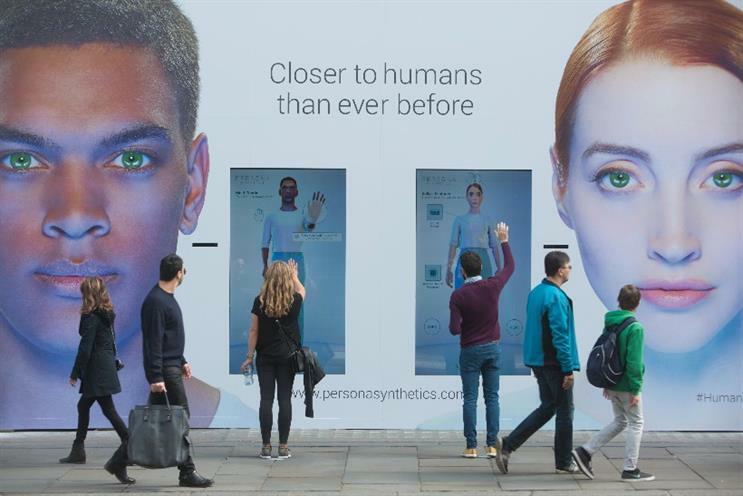 The TV channel created a pseudo brand called "Persona Synthetics" and opened a shop in Regent Street on Sunday, offering consumers the chance to bid on synthetic human robots - called 'synths'. The stunt timed with the release of a TV ad to promote new drama 'Humans'. Channel 4 claimed the stunt had whipped up a social media furore, trending on Google UK. The push is being supported with the hashtag #Humans. Two-metre high robots placed behind the pop-up shop window were built using Microsoft Kinect technology that could mimic and react to the movements of passers-by. The robots will remain at 172-178 Regent Street until 17 May. The drama is set in a parallel present day, where 'synths' are a must-have gadget. "The world of Humans is perhaps closer than we think," said Channel 4 head of marketing, James Walker. "This campaign seeks to engage viewers in a mischievous way with the questions the series raises about artificial intelligence: How will AI affect our relationship with technology and each other? Would you buy a Synth to be a part of your family?" The brand has also created a fictitious website and social media presence for the "robot manufacturer" Persona Synthetics.